I like this new area. So do Angus, and Leslie, too (I think). I moved to Cambridge, Idaho in August to start a new career as a high school English teacher. 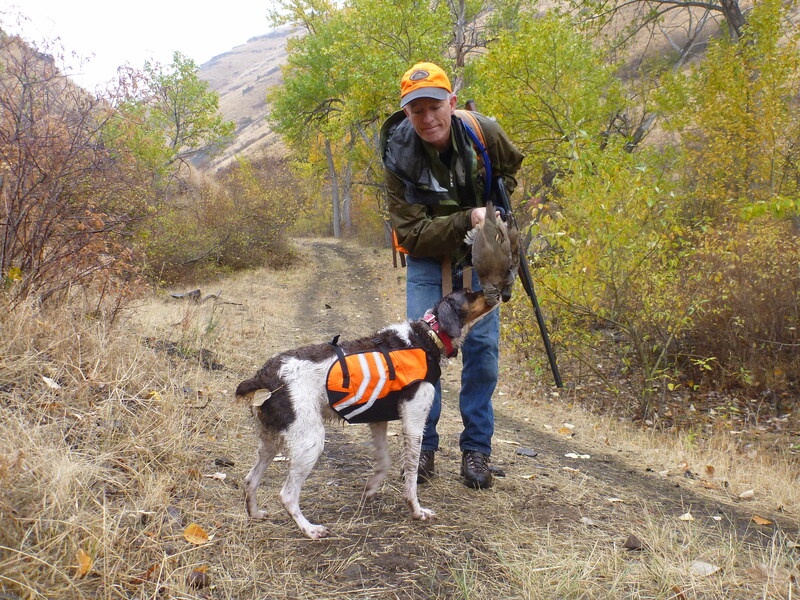 For me, one of the draws to this place was its proximity to Brownlee Reservoir, the hills near which are famous for chukar. 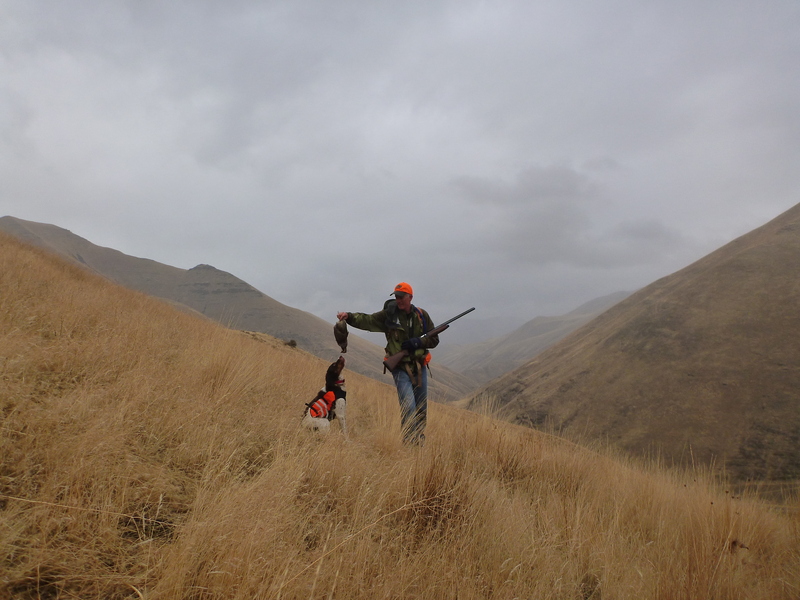 I pictured endless days of nothing but hiking up and down the cheatgrass and basalt slopes searching for alectoris chukar. School started August 20, reality set in, and weeks screamed by with very little time in boots. Things settled down a wee bit in late September, at least enough to feel I could afford a half-day on the weekend to explore the area with Angus and, if she was able to come up from Boise, my wife. Leslie is the skill behind the video and still cameras, girded by impressive fitness and even more by a remarkable interest in this activity, despite having once been a member of PETA. Still, the only shooting she does is with a camera. Anyway, I went one place when it was hot and very dry and found one very small covey despite some serious elevation and extended trekking. We took one bird off that hill, thanks to a marvelous but treacherous retrieve by Angus down, and then back up, a few clifflets. Like most reports of the early season’s drought-induced, parched habitat, mine was fairly bleak. Rain and “green-up” badly needed. Then it rained and snowed a little and, suddenly, got really cold. Any green-up got frozen and stayed below the surface. A new system with warmer temperatures and plenty of precipitation descended on us in late October, though, and today I saw the first little bits of green popping through the soil. Hopefully it will stay warm long enough for the birds to get full, happy, and healthy for the winter ahead. Yesterday we found our first good spot and now I’m really excited. We hadn’t intended even to get out of the truck since it was cold, very windy, and raining. But Angus needed some exercise so we took a little stroll up a trail along a creek and suddenly heard what sounded like an ATV on the hill above us. It was a huge covey of chukar leaving the creek. The fun began, and soon we were into chukar and Huns. Less than an hour, two birds in the bag, and I can’t wait for more. 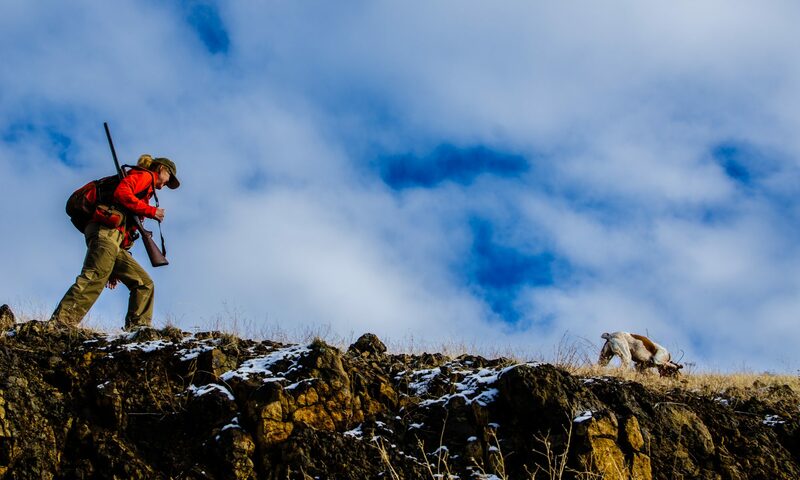 To riff on the motto of our principal’s email signature, “The worst day chukar hunting is better than the best day at work.” Yeah. Below is a video compilation of the stuff we’ve done so far this season. Look for more soon (I hope).